★ HOT TARGET PROFESSIONAL CHEF QUALITY STAINLESS STEEL TONGS; our tongs are made from a thick, 1mm corrosion resistant 304 stainless steel for unbeatable strength and premium construction while remaining lightweight and easy to handle! ★ NON STICK, HEAT RESISTANT AND DISHWASHER SAFE; Hot Target tongs are manufactured from a premium 100% Food Grade Silicone BPA and PVC free that won’t scratch your non-stick pans or grill grates. The non-stick silicone heads are heat resistant up to 480 degrees F – perfect for turning large cuts of meat while barbecuing! ★ EQUIPPED WITH A RING – PULL LOCKING MECHANISM AND NON DETACHABLE SILICONE HEADS; our ring-pull technology will keep your tongs from opening and closing accidentally which will allow you to facilitate better control while using them. 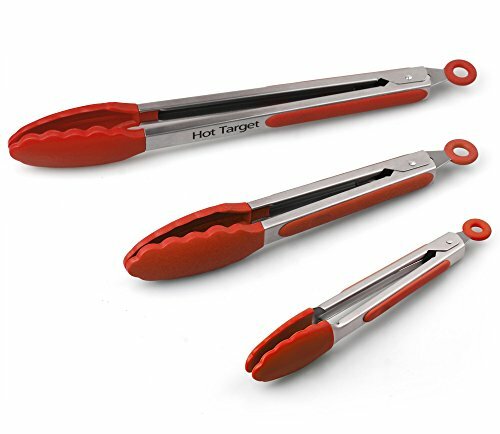 Hot Target tongs have been designed with one piece non-detachable heads to prevent the buildup of bacteria. They are super easy to clean and our hanging ring-pull mechanism allows for convenient air-drying and storage! ★ 100% SATISFACTION GUARANTEED; if for any reason you are not fully satisfied with our product, you will get a full refund.